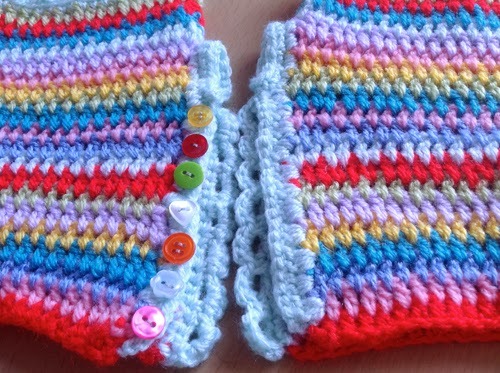 Last November, a lovely pattern for a pair of crocheted stripy mitts appeared in Facebook. I loved them straight away, and 'Shared' them on my page. 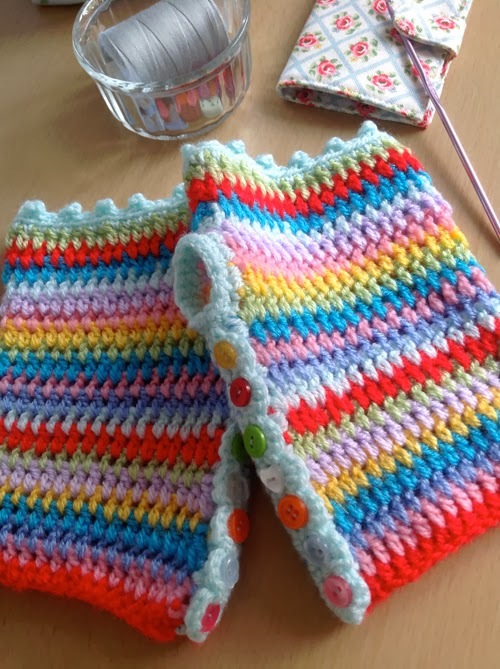 Devised by Sandra at Cherry Heart, she had made them (an excellent use of very short lengths of yarn) using a range of colours in Debbie Bliss Baby Cashmerino together with a variety of nice little buttons for decoration. 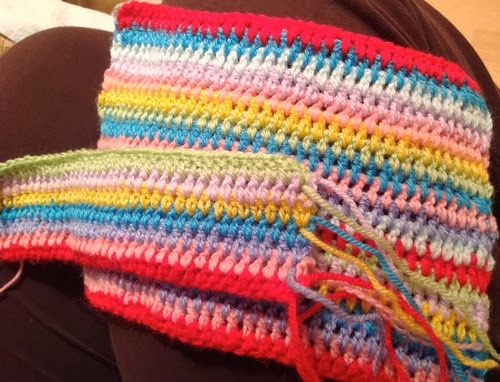 A friend sent me a message on Facebook, saying that she loved the mitts too and would I make her a pair?........she would pay for whatever yarn was needed. 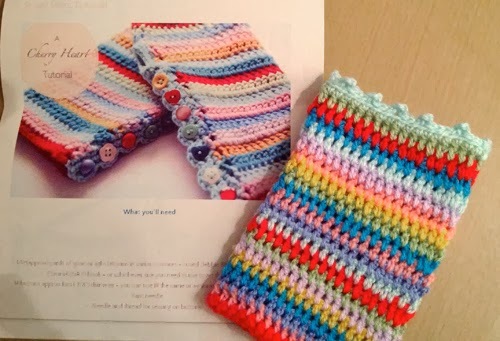 Well, not only had I never crocheted a pair of mitts/gloves before, but I have hardly ever worked solely from someone else's pattern as I tend to make up my own........ so I thought why not give it a go, especially if it meant I may eventually make a pair for myself too! 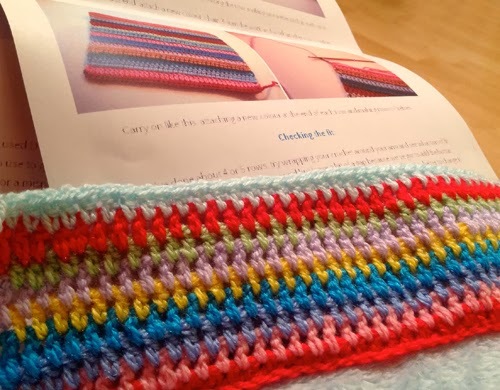 Nine colours in Debbie Bliss Baby Cashmerino isn't cheap for a pair of mitts (or two pairs for that matter). This is presumably why Sandra was using up the ends of colours that she had left over - a great stash-buster for small amounts. Initially I toyed with the idea of purchasing some of the fab 'small-ball' bargains that can be had for an excellent price on eBay, but eventually settled on some King Cole 'Dolly Mix' that was in the sale at Deramores in 25g balls, and near enough the exact colours that I needed. 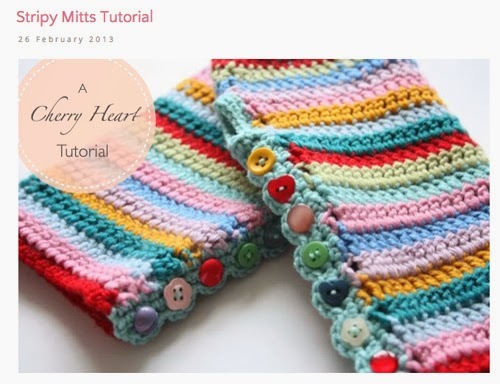 The mitt can be created either by using the standard pattern or following the excellent tutorial, which seemed the best choice for me. Sandra explains everything really well with plenty of excellent pics (although I did notice that my stitches came out a little different to hers). 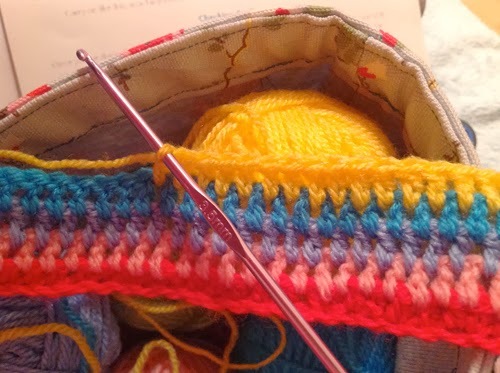 The square shape for the first mitt was fairly easy to create, the only slight downside being all the ends that need weaving in - but that's multi-coloured stripes for you and there really isn't any way around it. With all the ends woven in, the next part involved continuing the rows on the top area of the mitts which are crocheted in a complete loop for several rows. Seven buttonhole loops and a facing edge for the buttons can then be worked from the wrist edge. 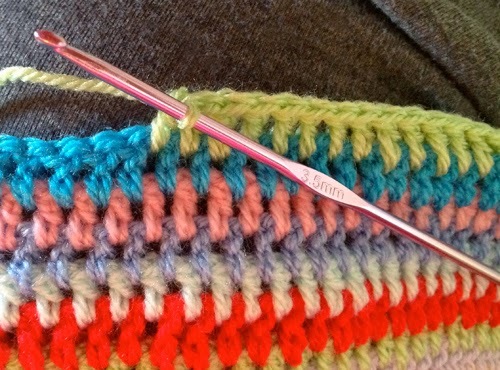 The thumb hole is added in a similar way with two neat little rows of double crochet. 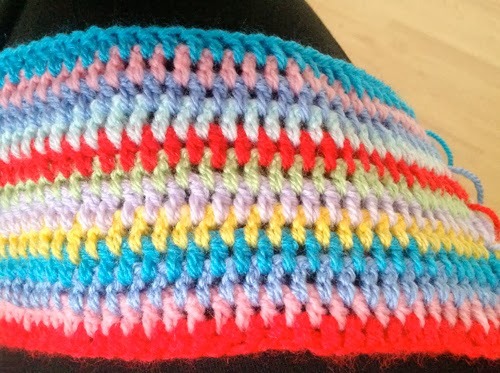 Then the tricky part (which I actually quite enjoyed) of adding the buttons (another first for me! 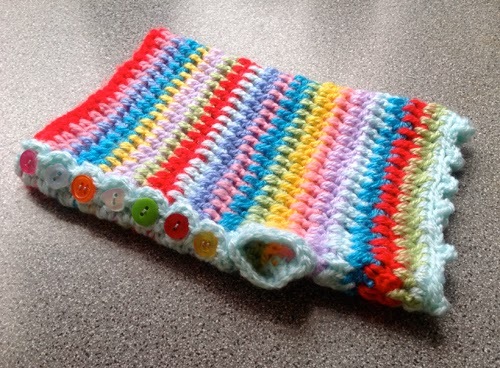 ), hopefully lining them up with the buttonholes that you have just made!!! Adding buttons all the way to the cuff, this turned out very well and I was sooooo pleased! A very smiley moment!!! 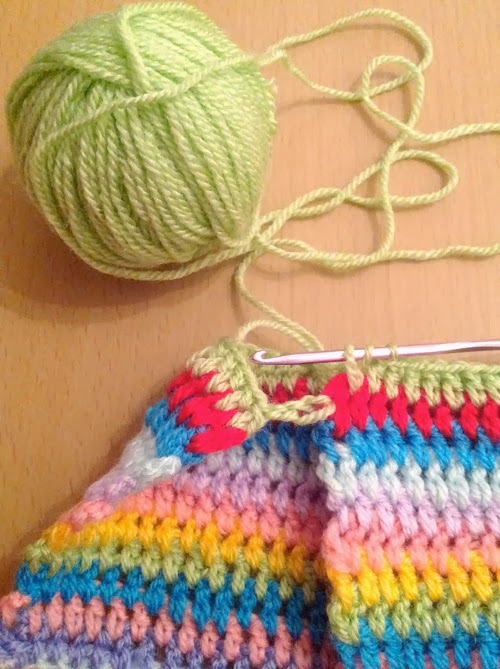 Repeat the process on the other glove, and there you have it - a fab pair of warm and beautifully stripy mitts! Now I just need to start on a pair for myself! 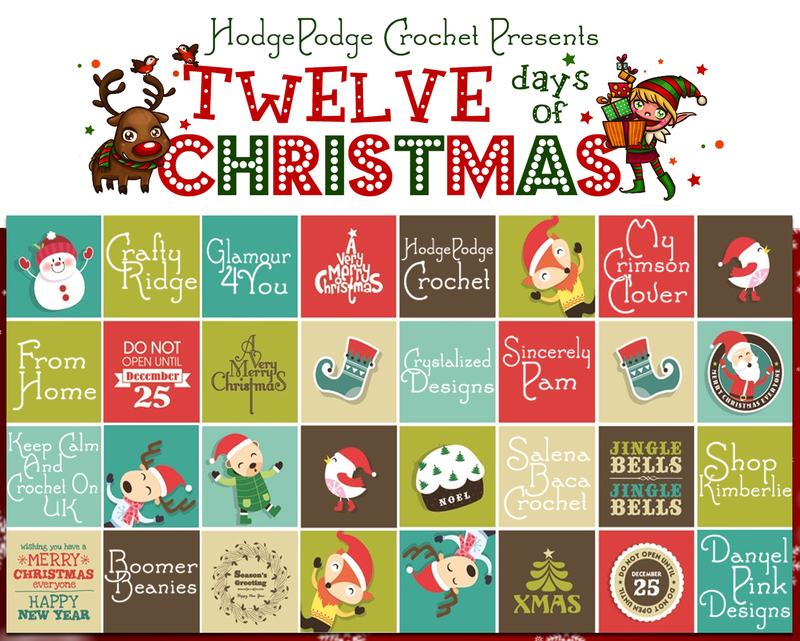 Thank you Sandra for providing a great pattern with well thought out instructions and a detailed tutorial. Your feedback means a lot!